Looking for that perfect item for your gamer geek pal? 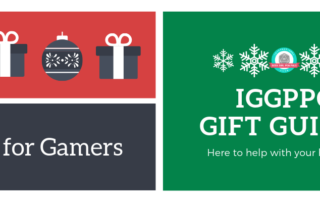 Here's a round up of some fun things to gift your gaming-loving friends to keep them playing through the coming months! Looking for some creative, geeky gifts for the holiday season? Are you wanting to treat your pen pal to something fun and fabulous for their letter writing? Here's a round up of some fun things to send to your pen pals this year! Looking for some creative, geeky gifts for the holiday season? Perhaps looking for that perfect item for your fashionable geek pal? Here's a round up of some fun things to gift your friends who have that touch of geek chic this year! Looking for some creative, geeky gifts for the holiday season? Perhaps looking for that perfect item for your bibliophile geek pal? Here's a round up of some fun things to gift your book-loving friends to keep them reading through the coming months! Looking for some creative, geeky gifts for the holiday season? Perhaps looking for that perfect item for the person who doesn't need any more "stuff" but you still want to treat? Or maybe you are participating in #GivingTuesday and want to do a little charitable giving. Here's a round up of some fun things to gift your friends while also supporting some good causes! Looking for some creative, geeky gifts for the holiday season? Wanting to gift the geekling in your life with something a little bit different that will spark their imagination? Just wanting some good gift ideas for the geek kids in your life? Look no further! Here's a round up of some fun things to gift your geeklings this year! Here are IGGPPC, we like to turn the spotlight onto small, geeky businesses, especially those run by women. This week we're checking out FanFlaire, a super rad shop that sells pins and patches for some of our favorite geek loves. Let's get to know a little more about shop owner Sarah and her awesome business! Get Kawaii: Smoko, Giving Your Home A Magical Look. The ukulele (uke) is a small fretted instrument that, we’ll admit it, kinda looks like a small guitar. Modern ukes were developed from the Portuguese machada (or machete), which was brought over to Hawaii in the 1800s by settlers. Introduced to North America through the Panama-Pacific Expo in 1915, the uke became a popular addition to jazz bands in the 1920s, and has fans all over the world, particularly in Japan. Hello, and welcome to the column where we explore our favourite ‘geek loves’. Whether you’re reading to find a few ideas for that ‘five geek loves’ list as you search for a pen pal, to pick up a new hobby, or you want to know “what is that?” we’re sure to have something for you. This week we're talking about washi tape!